HUMIRA treats inflammatory autoimmune conditions, and is the only successful treatment available for a rare and debilitating condition called Hidrentinitis Suparativa. We wanted to get sufferers the information and support they need get diagnosed and on treatment. We mined search data to understand what information was most valuable. And distilled patient insights into distinct personas and use cases. to craft solutions that always deliver on patient need with valuable content and tools. 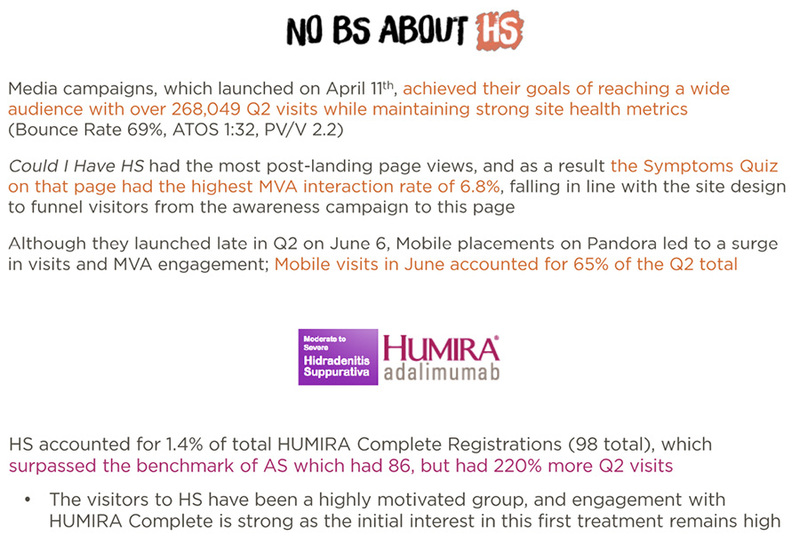 We created NO BS About HS, an unbranded diseased awareness platform, with stories from real patients who overcame their struggles to get diagnosed. We delivered digital media on Pandora radio and endemic sites like WebMd, driving to nobsabouths.com; where information and tools help sufferers understand the condition and take action towards diagnosis. We delivered those stories within ourhsyearbook.com, as a responsive quilt of socially enabled patient videos, animated gifs, memes. Mixed within the patient content were valuable patient tools to find treating dermatologists, information about how HUMIRA works, and access to community support. UX design and InVision prototyping supported the work throughout Abbvie’s regulatory process; to deliver their first responsive websites utilizing Adobe Experience Manager. The results were impressive and, the work was nominated for an Effie; empowering continued investment in the work.